In the past two years, Los Angeles artist Julia Holter has released three albums. The first two, Tragedy and Ekstasis contained nods to ancient Greek plays and Virginia Woolf. Her newly released third, and first for Domino Records, was influenced by the novella and movie Gigi. Lowbrow this is not. Loud City Song is the first of her albums to be recorded in a studio with other musicians and features a definite jazz flavour on many of the tracks. The first notes heard on single “In the Green Wild” are of a double bass one would normally hear pouring out of a jazz café. A breathless cover of 60s R&B staple “Hello Stranger” shows what a beautiful singer Holter is and does not sound too dissimilar from a slow motion version of Lisa Stansfield. Towards the end of the album, there is a Feist like bounce on “This Is a True Heart”. 2012’s Ekstasis’ dream pop was perfect for falling asleep to but Loud City Song comes alive while walking through the city on a bright and sunny afternoon. The appropriately named “Horns Surround Me” is enhanced by the rustling of fall leaves under feet, the sound of cars rushing by, and birds singing. 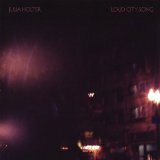 On Loud City Song, Holter has truly captured the sound of the urban environment and is a vibrant follow-up to her first two excellent albums.